The Settlement Building in Vancouver, BC is the location for an all in one urban oasis. This oasis houses a winery, brewery, and restaurant/lounge all under one roof. Patrons drawn to this space get to experience all locally produced products in one location. Lets take a look at three different subdivisions of this multi- faceted business. The Vancouver Urban Winery was the first business to inhabit The Settlement Building. The fashionable urban wine experience brings the community closer to the wine production process. Instead of people having to take a trip to a vineyard they can learn, taste, and swirl closer to home. 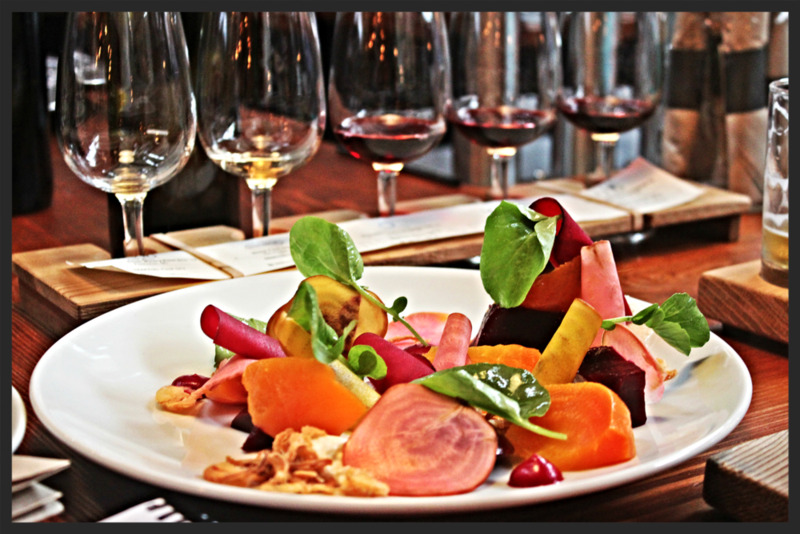 It provides a location for patrons to taste and discover wines from throughout British Columbia. The venue offers wines on tap for on site consumption, which not only eliminates waste from your normal wine bottles but also serves as a unique vessel. There are 20 white wines along side 16 red wines on tap. The wine flights include a sampling of 5 wines and are sampled in a progressive manner based on body. A selection of beautiful crystal decanters provide a vessel for customers to share quantity equal to a bottle of on tap wine. The most distinguishing characteristic of this part of the venue is the wines on tap concept. Postmark Brewery was the creation of three long time friends with a passion for beer. This aspiration is evident when you visit the brewery and see the love and craft that goes into each individual batch that is brewed. The brewery is exclusively run and operated on site at The Settlement Building. Patrons can see the beer being fermented and the operations of the brewery. There are several distinctive things about this brewery including a custom designed growler counter, tasting flights, and exceptional seasonal beers. An fashionable growler counter and filling station in which visitors can pick up or refill growlers without even stepping foot into the main venue space. Locals love the ease of this set up because they do not have to wait in line and can immediately get access to locally crafted beer. 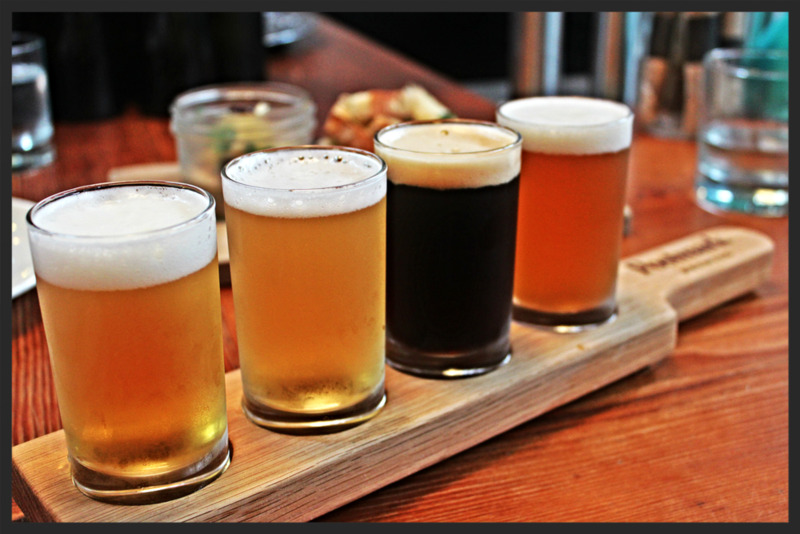 Tasting flights are available in the lounge and are served in a gradual manner established on hop. Patrons can choose from Pilsner, Saisonella, Dry Irish Stout, IPA, and seasonal beers. The seasonal beers that are offered are enough reason to check this place out. The current offering is a Butternut Brown, which is a Northern English Nut Brown with subtle roasted butternut squash flavors. It has an ABV of 4.3% and 18 IBUs. The Belgard Kitchen is the place where everything comes together as a wine bar, brewery, and lounge where they offer lunch, brunch, and evening fare. This space maintains a “Social Eating Concept” which provides a fun and social environment. The food menu is served progressively from light appetizers to heavier fare. The lounge gives patrons a chance to taste the wine and beer being manufactured by Vancouver Urban Winery and Postmark Brewery. The best way to try all these products is through the many tasting flights being offered. The venue utilizes some of the beer and wine in the preparation of dishes including a beet salad with Postmark IPA and flank steak with chimichurri with a Malbec molasses. This concept of an all in one urban oasis is a very distinctive concept that is trending throughout Vancouver and globally. This manner of establishment is ideal for small, craft enterprises that want to partner together and offer patrons a more elevated and diverse experience.